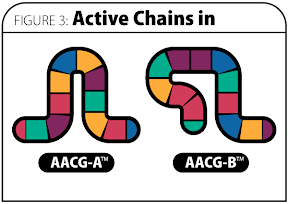 hA2cg (AACG-A and AACG-B) 8X, 12X, 30X, 60X, 200X Bioidentical active amino acid chain groups that are naturally found in the Human Chorionic Gonadotropin molecule. The "hCG Diet" changed little in the first decades after Simeons published his findings. It also remained a fairly obscure approach to weight loss, due largely to the high cost and considerable discomfort involved with the daily injections of hCG that the protocol originally called for. It wasn't until the introduction of homeopathic hCG drops (administered orally) that hCG-based weight loss became a viable option for the general public. This development happened to coincide with Trudeau's best-selling book extolling the virtues of the diet, and soon hCG diets were everywhere. 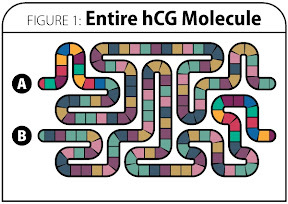 The hCG molecule is comprised of 244 amino acids in two ribbons or chains (figure 1). 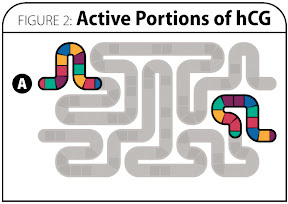 Research has demonstrated that only small portions of these chains actively contribute to hCG's effect on weight loss (figure 2)--the remaining amino acids in the molecule serve no function, and require processing by the body before the hCG can have the desired effect. Although the molecule serves its function, it does so inelegantly and inefficiently. DesBio has isolated those effective chain groups (figure 3) in a new homeopathic formula that eliminates the unnecessary amino acids. This new formula, hA2cg Evolution, delivers AACG-A and AACG-B (the only active portions of the hCG molecule) in combination with the 21 time-tested supporting ingredients that made hCG Professional Formula such a huge success. This refined dual-form can deliver its message to the body without interference, resulting in an improved reset of the diencephalon, reduced side effects (weakness, energy loss, etc. ), fewer "plateaus" or ineffective periods during the hA2cg Diet, and, ultimately, better results. When paired with a full body detox & regulation, hA2cg Evolution delivers unparalleled results, with thousands of practitioners reporting significant success with tens of thousands of patients. 10 Drops under the tongue, 3 to 6 times per day or as directed by a health professional. Bioidentical active amino acid chain groups that are naturally found in the Human Chorionic Gonadotropin molecule. Hypothalamus sarcode includes the diencephalon and give support to the hypothalamus. Gambogia support conversion of carbohydrates, resulting in reduced fat storage. Brain suis provides additional support for the diencephalon. Liver sarcode is included to accentuate liver metabolic activity. A great deal of metabolic activity, including the breakdown of fats, occurs in the liver. It also aids the liver in eliminating waste products from fat metabolism (known as Detox and Drainage). Kidney sarcode enhances the waste removal capacity of the kidney. Proper kidney drainage is an essential component of any weight loss program to eliminate heavy metals and other toxins which are released during fat loss. Glucagon is an important hormone involved in carbohydrate metabolism. Produced by the pancreas, it is released when blood glucose levels fall too low, causing the liver to convert stored glycogen into glucose. It is included homeopathically to encourage fats to be metabolized first so caloric needs are delivered by consuming fat instead of sugar. Insulin is included to enhance fat metabolism by transfer of lipids from adipose tissue to the liver for mobilization as an energy source. Its homeopathic intent is to support optimal glucose levels in the body. Adenosine-5-triphosphate (ATP), is the energy unit output of the Citric Acid Cycle (Krebs Cycle) that transports chemical energy within cells for metabolism. It is used by enzymes and structural proteins in many cellular processes, including biosynthetic reactions, motility, and cell division. 7-Keto DHEA is a powerful weight loss nutrient with no stimulant effects. It increases metabolic rate by increasing T3 thyroid hormone output and increasing fat metabolism even while at rest. Methyl B12, a form of Vitamin B12, is important to the Methylation metabolic pathway in the liver which metabolizes fat soluble toxins stored in fat cells. Sarcolactic Acid forms in muscle tissue during the muscle exhaustion, acidifying the body and decreasing the efficiency of fat metabolism. 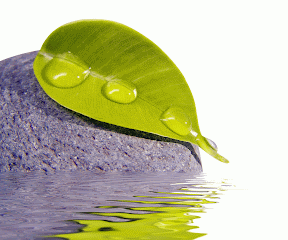 Homeopathically it is intended to support acid metabolism. Stomach sarcode supports healthy stomach function to promote proper digestion and metabolism of food. Graphites is a homeopathic remedy for supporting weight-management and reducing hunger. Nux Vomica is a common homeopathic remedy to reduce cravings and desire for fat intake and for treating all forms of addictions (including food addictions). Phytolacca Decandra is useful in supporting weight-management, specifically addressing intense thirst and between-meal hunger pains. Calcarea carbonica is a traditional homeopathic remedy often used to reduce cravings. Asclepias Vincetoxicum is included for immune support. Chronic viral loads are considered to be a cause of obesity. It is also indicated for dropsy, great thirst and profuse urination. Echinacea is included for immune support. It is indicated for acute auto infection, blood poisoning and septic conditions. This is a safe form of Echinacea for those who do not tolerate the herb. Gelsemium Sempervirens is derived from a flowering vine and has traditionally been used homeopathically to support the immune system. Named for the famous flower essence physician, this homeopathic bowel nosode enhances the effectiveness of other homeopathic remedies in weight management. Many patients who are obese deal with traumas of some type. Proteus Bach is also indicated for stress, trauma and nervous system support. It is a powerful remedy that has the combined effect of 14 standard homeopathic ingredients.